Some things just have to be learned the hard way and I wish I could get a mulligan on some of the decisions I made. This is a google image but it perfectly represents the squatty tough look of a truck that I once had. At least in Houston, this is called a "high cube van". The guy who drove it down here was a HVAC mechanic that took a job with us and he decided that it just didn’t carry enough. 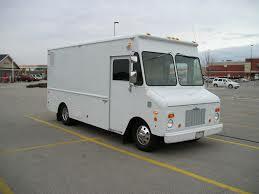 ​His next truck was a step van similar to this and it was considerably larger. I bought the high cube van (now named Gronk) and put a serviceman in my Datsun. If you can imagine 3 ladders on top, this was the general appearance of my van. It can be impressive to a customer when you show up ready to work. A pair of second hand roof racks was all it took to carry all my ladders but I had to fix the rust. My dispatcher had once worked for a sheet metal shop and he cut out the cancer and fabricated new sheet metal. Easy job on a box. I pulled a 16 foot tandem trailer and loaded it and the truck with firewood. When not processing or delivering firewood I just drove the truck for a full day of repair jobs. It was tremendous but being tremendous is not enough when the owner has brain rot. How many tons of firewood can a one ton truck carry and pull. I don't know either but two cords of oak firewood can fit inside that cube. They can also collapse the front end and cause it to eat up front tires. The expense of tires coupled with an insatiable thirst for fuel was something I needed to bid goodbye. Despite it's thirst I developed a tremendous respect for the 350/350 Chevy power-train combination. So much respect that I went back to it later in a station wagon that became an art car. Since I don’t recall ever getting 10 mpg in this truck I fixed the front end and sold it to a furniture repair business in downtown Houston. Sometimes something just has to go and so it was with the firewood business. Doing a Chimney Sweep can be very demanding physically. Things like carrying a 13X17X24X1 ceramic tile to the top of a 32 foot ladder is hard enough without delivering a load of firewood afterwards. You couldn’t hire a guy to do it, pay him enough to keep him involved, and still make a profit. The firewood business had to go away but we still had variety. HVAC plus Chimney Sweep and repair. In the summer one of my sweeps also cleaned windows. One of my competitors did fences in the summer. In Houston, if you are going to work on chimneys you need a side job. I liked the versatility and power of my cube van. 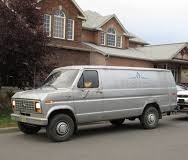 I found a van similar to this google image. I think this is an E350 and mine was an E100. It had a 300 six (carburated) and a C6 transmission. Like this there was an additional 18" or so welded in at the back. I added the almost obligatory overload springs and a heavy trailer hitch. Somewhat less power but back in the business of being versatile. It had a salvage title but with the miles we put on a vehicle we knew we would have to fix whatever we bought. Over the first 100k miles we rebuilt the engine and the transmission. The rest of the vehicle was hard to break. When the engine went we found that it was actually a 240. Overworked or just worn? We installed a 300. We probably drove that truck for 150k miles. That included letting my niece use it to move back to Kansas. Wish I had a picture. Pulling a u-haul with things tied to the top. Looked like the Beverly Hillbillies. There was not a thing wrong with this truck. If I must nitpick the sliding door was not my favorite and I installed a side mounted back seat for my son and his friends. In normal use it got over 15 mpg and even better with the ladder racks removed. In 1991 I entered a state program that Texas called the ACP or Alternate Certification Program (for teachers). It took a summer for the initial phase of the program and a year working as an intern. Luckily the program requires participating districts to pay first year teachers scale while the training is going on. Everything is relative. When you have to carry tools and go to jobs, 15-17 mpg in a van isn't bad. When you have to commute 100 miles a day, it is. Teaching did not pay as well as HVAC work but it had a lot of other rewards. With those rewards came a commute of 100 miles per day. I sold the truck and bought a Honda. This thing was tough. I took it to visit my mom in Kansas shortly after I got it. About 100 miles into the trip the transmission started whining, then jumping out of 5th gear. Luckily it had an owners manual and I had some tools in the car. I found that Honda used motor oil in the transmission and the manual showed me where to check. I bought a funnel for automatic transmissions, some duct tape, and had a little piece of copper tubing left over from a job I had done. I added some decent motor oil till it was topped off. It was still loud but no longer jumped out of gear. I have heard many things about oil additives but I had a unique experience here. When I got home I drained the transmission and added a quart of slick 50. If I remember correctly it only took about 1 1/2 quarts so the oil in the transmission was primarily slick 50. The whining reduced markedly and I never had problems again. It did not lose oil so I don’t know why it had been low. I had never checked transmission oil of a manual transmission before or since. Like everything else I drove back then, this car had to earn it's way. I did a couple favors while driving that car and one involved installing an air conditioner for a friend. It would hold all the tools needed for the job but not, of course, the air conditioner. The engine was plenty strong enough but for carrying real weight, fwd is scary. ​I once went to another town to pick up a contractor and his tools when his truck broke. It had been raining but had stopped and there were wet patches on the road. With the weight of his tools the drive wheels would spin every time it hit a patch. It did not swerve but watching the tach soar was scary. It could have worked for my purposes with a small trailer with a weight distribution hitch. However, I cannot call this a moonlighting workhorse. I became a firm fan of hatchbacks as I found I could do quite a bit when I had the time. 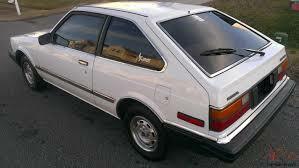 I spent some time wishing Chevy still made hatchback Novas. However, there were things the Honda wouldn’t do and that was just about the last time I let myself be without something that would pull a trailer. This was a moonlighting workhorse despite what you may think. I liked the Honda but it only got about 22 mpg. My town car was an 85 so Ford still called it a 302 and it got about 20 on the hiway. There was also the thing of having the Honda fail to start so many mornings. Took my mechanic forever to find an electrical problem that kept killing alternators. Once again, a good price didn't hurt. One of my neighbors had bought this Town Car as an investment. He figured that they weren’t going to keep making big cars and that this would appreciate in value. Obviously he was wrong on both counts. It was still very early into my teaching career when a new school opened up close to my home. I really did not want the transfer but nobody else wanted to go there. It turned out just fine as my 80 mile commute had changed to 20 so this car was an even better fit. I got a of comments driving this car with the Datsun trailer behind it. Another trailer was a 16 foot tandem axle job and I was able to do as much as anyone with a truck. When I went to teach I just unhitched. With the Datsun trailer I could roam the town doing moonlighting. I wound up passing this along to my son because he just needed to be cool and I obviously didn't. Probably also because I had come across the aforementioned 77 Impala wagon that was even more versatile. Anyway, he wound up wiping the lobes off the cam with an engine that I thought couldn’t be killed. This was about 95 or 96. I had come to the conclusion that it wasn’t going to do any good for me to pretend to be upper class with a town car. I was teaching industrial arts to a bunch of special needs kids and I needed a project. That project for two years running was to make an art car that celebrated the Rockets and their championships. The 77 Impala and the 79 Datsun truck became the victims of that project(s). The enthusiast who finds himself reading this might grimace at the thought of a classic (or not) car being turned into a parade float but the kids loved it. Guess there must be some kid left here too because I loved it too. Contractors need wheels that work as hard as they do.